HANNIBAL – Students in the Hannibal Central School District recently benefited from the annual Stuff-a-Bus campaign, as hundreds of school supplies were distributed as part of the giveaway. 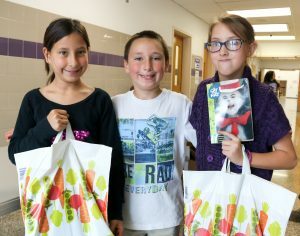 Hannibal Central School District students Leanna Bobay, Dylan Crowe and Ashley Bacon are all smiles after picking up new books and school supplies during the recent Stuff-a-Bus distribution day. The annual effort, spearheaded by United Way of Greater Oswego County, provides new back-to-school supplies for students in each of the nine school districts in the county. In Hannibal, members of the district’s Faculty Association helped sort hundreds of pens, pencils, glue sticks, rulers, notebooks, binders and scissors that were then bagged and given to students. This year, the HCSD provided nearly 175 bags full of school supplies to its students. In addition, students received a book courtesy of Brooke’s Books Project, an initiative that provides books to local schoolchildren. According to Cindy Clover, of the Hannibal Faculty Association, the effort was a success thanks to the United Way, community donors and through the efforts of the HFA to help sort and distribute the supplies.